The River Jordan by Michael Manning in the background…I want it. Last Friday, I was in need of some culture, so I decided to check out a couple gallery events. First, I attended the opening night of the Axis International Art Festival in Ravenswood. It was hosted in a gorgeous loft, complete with black iron winding staircases, high exposed ceilings and spacious rooms. I wish I could live in a loft on Ravenswood one day. I heard about the Axis Fair on Sergio Gomez’s blog, which is an excellent source for artists and art lovers alike. There were some excellent pieces there; among them a huge painting (The River Jordan by Michael Manning) that I fell in love with and some glass sculptures that caught my mom’s eye. There was also an entire gallery exhibiting from Seoul, South Korea. It was very cool to get a glimpse at Korean artists’ work. In the entry hallway, I really liked some comic-y looking art by CJ Hungerman who is apparently a really big deal now that I’m looking online. I even ran into the festival’s executive director Mi-yeon Kwon on the way out. Next up, we headed to the Society for Arts gallery on Milwaukee. 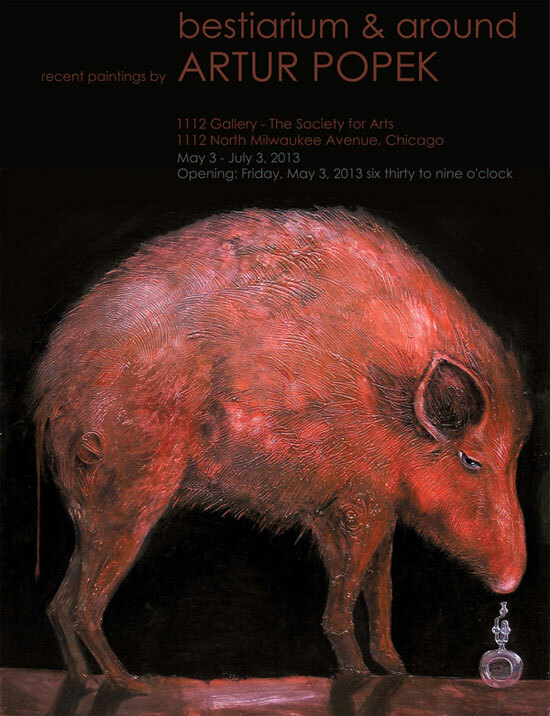 This is a staple of Polish art exhibitions in Chicago, and they’re currently displaying the work of painter Artur Popek. A first, I wasn’t sure how I felt about his dark paintings featuring various animals, but as I kept looking at them they really made an impression on me. They seemed distinctly Polish to me, but that may be that they just reminded me of a poster my mom used to have up in our house when I was young. Regardless, there was something ultimately quite endearing about the big furry elephant, pig, hog and the “psiosiak” (dog-pig creature). The exhibit runs through July 3, so be sure to check it out.